This week is World Autism Awareness Week. It’s estimated there are over 1,000 people on the autism spectrum in the Dewsbury constituency, and as a member of the All-Party Parliamentary Group on Autism, I take a strong interest in autism provision in our area. I’ve met many families who are dealing with autism and what it means for them day-to-day. Locally we have some great groups for families who are affected by autism, like The Whole Autism Family and I support the fantastic work that they do. The one thing above all others that autistic people tell the National Autistic Society that they want to see change, is an increased public understanding of how the condition affects people. So this week, I’m proud to be supporting World Autism Awareness Week – it’s a great opportunity to raise awareness of the condition. Whilst awareness of autism is higher than ever, with most of the public having heard of autism, only 16 per cent of parents and carers of autistic people told the National Autistic Society that the public understand how autism affected the way they behave in public. • Benefit from extra time to process and respond to communication. With this in mind, I have been working with local supermarkets toward making stores more accessible, and was glad to support ‘Autism Hour’ and visited a local Sainsbury’s that took part. By following simple steps to lower the lights and music, this can be a great benefit to those who may suffer from sensory overload. 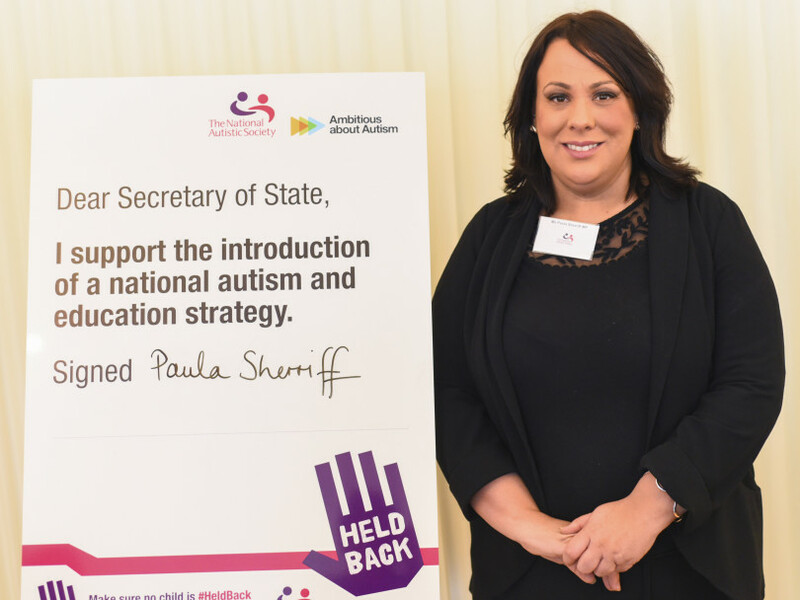 I am also proud to be backing the National Autistic Society and Ambitious About Autism campaign, ‘Held Back’, to ensure the government introduces a national autism and educational strategy. The campaign is in response to a report that found that, three years after the Government introduced a new special educational needs and disability (SEND) system in England, the education system is still failing to meet the needs of autistic children and young people. I have spoken with constituents and heard personal accounts from families who are still struggling to secure the right school provision and educational support for their autistic child. Worryingly, some 50 per cent of children on the autism spectrum have to wait more than a year for the help they need at school. I welcome the report’s key recommendation that the government needs to develop a national autism and education strategy. This would provide training for staff, steps to provide reasonable adjustments for pupils, how to combat bullying and guidance for local authorities. As Labour’s Shadow Minister for Mental Health & Social Care, I will push for this. This issue is so important. We must ensure all autistic children receive the education they deserve, so that no child is held back because they’re autistic. This week I urge readers to spare a moment to find out what’s going on for World Autism Awareness Week. Everyone can take small steps, like talking to those who are unaware of the condition and taking time to imagine what it might be like to live in a world with too much information. Together we can help make the world a friendlier place to those who are affected by it.